Enjoy a walk through the historic town of Carnation and learn some of its stories and secrets. Our self-guided tour of downtown Carnation is a fun way to learn about historic buildings and the stories they have to share. Click on the links for each of the stops to see historic photos. Itinerary designed with generous support from 4Culture King County Lodging Tax. Start your day at Tolt MacDonald Park. This 574-acre park sits along both the Snoqualmie and Tolt rivers and is a popular spot for camping, hiking, and picnics. Once you find a parking spot, head west to the Snoqualmie River to check out the suspension bridge. This impressive bridge was the vision of John MacDonald, the namesake of the park. MacDonald was a banker, Navy veteran of World War II and volunteer for the Seattle Council of Boy Scouts of America, and had big dreams for the property that had been acquired by King County in 1964. One of the key ideas was building a bridge that would connect the two sides of the park, split by the Snoqualmie River, He found help in completing the project from the Army Reserves’s 40th Engineering Company, which worked on the approximately 500-foot suspension bridge. Unfortunately, John died just a few months before the project was finished, but upon completion it was given the name Tolt-MacDonald in his honor. To start your tour head east on the main entrance road that you drove in on. Soon you will find yourself at the Hjertoos Farm (also known as the Carnation Tree Farm). You’ll see a beautiful Victorian home on the right hand side.The Hjertoos House, a King County Historical Landmark, was built in 1907 by Bergette and Andrew Hjertoos (one of the first settler families to arrive in Carnation). In 2018 the Tolt Historical Society moved their museum to the Hjertoos House. The museum will be open to the public in 2019. Take a right after the house onto a dirt/gravel road to walk through the Hjertoos Farm and past the Hjertoos barn. The farm was developed in the in the 1880s among a wave of settlers. When the Hjertooses purchased the farm in 1901 from the Shaw family, it included a two-story log-house, a large house for boarders, and a substantial orchard. In 1905, the growing family built a two-story, wood frame farmhouse to replace the earlier structures. The elaborate two-story front porch, which had fallen into disrepair, was carefully reconstructed in 1988 based on historic documentation. The farm is currently used for both Christmas Trees and vegetable production. Read the full history of the farm here. Continue walking through the farm until you arrive at Highway 203. Safely cross the highway. On your right you’ll see Tolt Middle School. This was the location of the original Tolt High School (1914). In 1914 the communities of Tolt, Stillwater and Pleasant Hill combined resources to construct a two story brick high school. The school was completed in November, 1914, built on land donated by Andrew Hjertoos. The first principal was Ralph W. Keller and the first graduating class, in 1915, included four students. The school was demolished in 1970 and the current middle school was built in its place. The next stop is Valley Memorial Park. You can get to the park through the Middle School. Stay along the northeastern side of the school and take a left into the park (about 120 feet off the highway). The park property was originally part of the Entwistle family homestead. James Entwistle was the first settler in Carnation, arriving in 1858. The idea for Valley Memorial Park first originated in 1945 as a collaborative effort by the Valley Men’s Club and Mr. David Entwistle (James’ son). The park was constructed between 1945 and 1949 with volunteer labor and donated materials. In 1947 a committee from the Men’s Club and the American Legion voted to install a World War II monument which still stands in the park today. Head all the way through the park and out to King Street, then take a left onto Blanche Street. You’ll soon arrive at St. Anthony’s Catholic Church (1914). Parishioners constructed the St. Anthony Mission Church in 1914 with donations from the Catholic Extension Society. The land was donated by Tolt resident Ronald McDonald, who continued to live in the house west of the church. Mass was only celebrated in the new building monthly as the priest was shared with the rest of the Monroe parish. The St. Anthony Church was separated from the Monroe parish and acquired its own priest in 1929. After that, masses were held weekly and the size of the parish grew. The first Mass celebrated in the new building was on November 6, 1914, and the church was dedicated by the Arch Bishop on November 13, 1914. Rev. D.P. Kelly was the first priest to serve at St. Anthony from 1914-1918. He was followed by Rev. Daniel Grace 1919-1924, Rev. Robert Dillon 1925-1926 and Rev. William Chaput 1927-1929. Next head north on McKinley Avenue for three blocks and take a right on Entwistle St. After two and a half blocks you’ll arrive at the Entwistle House (1912). This historic house was constructed in 1912 by David Entwistle (James’ son). David was the son of Jame Entwistle, the first settler in Carnation. James Entwistle filed a claim of 160 acres along the Tolthue River (now referred to at Tolt) in 1858 under the Donation Land Act of 1850. He ended up converting much of his subsistence farmland to hops, then lost everything when the hops market bottomed out in October 1894. His land was foreclosed on, but he was able to move onto another property in Carnation that he had purchased. Jame died in 1902 when he drowned in Seattle while visiting his daughter. He had been walking along the waterfront tracks and fell into the water at the approach of a train. Cross to Commercial St and head northwest back to the Highway. Take a right at the highway and head north two blocks to Carnation Elementary. The first school, Tolt Grammar School (1895), opened in Tolt inside a log shack built on Shamgar Morris’s property north of the town. Called School District No. 27, it had a window on each side, a fireplace and rough cedar benches instead of desks. Four students had to furnish their own books, pencils and paper and were taught by Mr. (first name not in the historic record) Hill. A second school house also on the Morris property used a box stove for heat and rough double-seat desks. During another heavy snow winter in 1882 (Corliss, 171), the third school built in Tolt began to function on the Prenatt farm. It had more windows than its two predecessors on the Shamgar Morris property and employed a playground and a bell to call the students to class. Miss Bessie Thistlewaite (subsequently Mrs. James Prenatt) was the first teacher, later succeeded by Margie Stafford. By 1893 this school was known as District 113 (Jones, 19). A new Tolt Grammar School was constructed in 1895 at the present site of Carnation Elementary School at Tolt Avenue and East Morrison Street. It operated independently from the school on the Prenatt farm. These two elementary schools, called District 27 and 113, finally combined in 1907 to form District 165. A total of 177 pupils comprised the entire elementary school district with J.M. Weaver as Principal (Bagley, 812-813; Jones, 20). The two story brick school building was torn down in November, 1934 because it was too small (Jones, 20). On May 10, 1935 a dedication ceremony was conducted for a new elementary school building in Tolt. Bordering the Carnation Elementary School to the north is the Carnation Cemetery. This cemetery dates back to 1905 when Frederick B. Bagwell donated the land which is now the northern section of the cemetery. Bagwell headed up the cemetery association, which was entirely comprised of Masons. However, the cemetery was open to everyone. The following year, however, the International Order of Oddfellows started their own cemetery association and their own cemetery, located directly across the road, to the south of Tolt Cemetery. Eventually, though, the two separate cemeteries would combine. In 1957, the Oddfellows took control of the northern half, and it remained in their possession until the mid-1990s when the city officially took over. Over the 2 acres of land that make up the Carnation Cemetery, there are several burials that pre-date the 1905 origin. These burials were relocated from nearby Pleasant Hill Cemetery when the new cemetery was established. Next head south, back into town, and cross the Highway to Tolt Congregational Church (1938). Originally dedicated as the Nan Fullerton Stuart Memorial Chapel, the church was dedicated on August 28, 1938. The original church was wood frame was between Tolt Grammar School and the cemetery and was dedicated 8-28-1898. It was destroyed by fire on Dec 30, 1936. E.H. Stuart of Carnation Milk Farm planned and paid for the design and construction of a new Congregationalist Church in memory of his wife who had died in 1937. The granite Gothic Revival style building became the second Tolt Congregationalist Church. The granite was quarried at Index, WA and the stone was patterned after Scottish architecture and topped with a Celtic Cross. The bell tower came from the original church. Head south on Highway 203 for two and half blocks to Miller’s Mercantile. Originally built in 1925 it was a variety store owned by Albert Prenatt. Albert was the son of Joseph Prenatt, an early Homesteader that had arrived in Tolt in 1868. Albert Prenatt sold his small variety store in Carnation to Howard Miller in 1940 who renamed it Miller’s Dry Goods. Howard and Marion Miller ran the store from 1938 to 1982. The Miller’s Dry Goods store was known throughout the Valley for providing clothing and equipment to farmers, loggers, and their families. Continue south down Tolt Avenue to Carnation Corners, originally built for the Tolt State Bank (Early 1900’s). This bank opened during the early 1900’s. Eri Barber Colwes, an early Tolt settler, built the bank and served as the first bank president. In 1914 it was the site of a robbery that shook the town and Seattle for days. Read about it in our blog The Day Carnation Became the Wild, Wild West. He enlarged the building in 1915 where he established a post office and rented to other commercial enterprises in this same building. Tolt State Bank expanded with the local affluence and changed its name to Snoqualmie Valley Bank in 1918. Head south on Highway 203 back towards Tolt MacDonald Park. When you arrive at 40th St you can look across to the yellow building, originally built to be a mens’ social club called the Independent Order of Odd Fellows (IOOF Hall) Lodge No. 148. 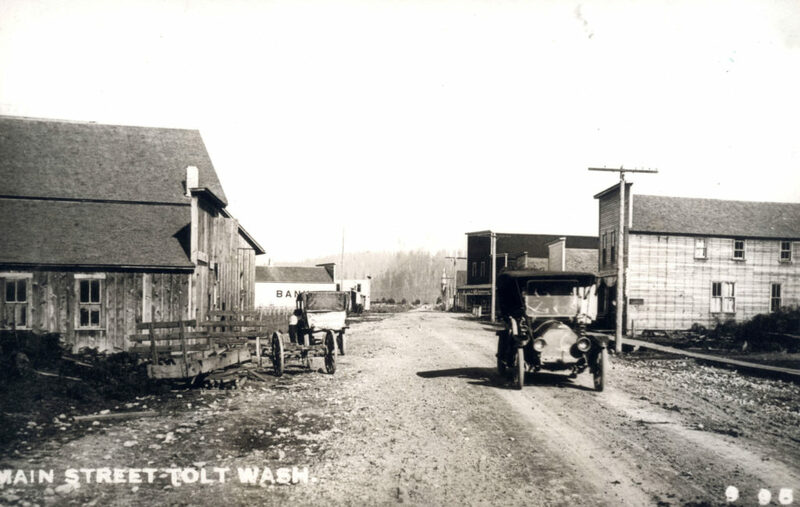 The club started in Tolt on March 20, 1895. The IOOF society had originated in England during the 18th Century and spread to the United States with its lodge system. It was one of several secret, self-governing group with ritualistic ceremonies and varied degrees of rank which were popular in America at that time. The Tolt Odd Fellows held their first meeting in a two story building near the Snoqualmie River owned by James Entwistle. The initiation fee was $20.00 which went to the construction of a meeting hall. They purchased a lot from George W. Shaw on the southeast corner of Tolt Avenue and NE 40th Street, and began construction. The Odd Fellows dedicated their new building on December 26, 1895. After 30 years of meeting inside this building, the Odd Fellows felt they needed a larger meeting hall. The Tolt Odd Fellows purchased a lot on the northeast corner of Stephens and Bird Streets from the Tolt Townsite Company on July 3, 1925 to construct a larger meeting hall. Construction estimates were $10,000 and the Odd Fellows were able to coordinate $5,000 in bonds, a majority of donated labor, and charitable assistance from their women’s auxiliary group, the Grace Rebekah Lodge, to pay for the structure. On October 22 1925 the first community dance was conducted in the new building. Community dances were a predominating source of local entertainment at the time, as well as a source of revenue for the sponsoring groups. The Tolt Odd Fellows held their first meeting in their new hall on January 14, 1926 and conducted a formal dedication ceremony on May 8th. On May 18, 1929 the Tolt Odd Fellows paid off all debts on their new meeting hall. Gradually, secret fraternal societies, including the Odd Fellows, declined in the United States and were supplanted by philanthropic service clubs such as Kiwanis, Lions and Rotary which admitted women. After 42 years of service, the Tolt Odd Fellows sold their meeting hall in 1971 and joined the Falls City Lodge. The meeting hall subsequently became the Sno-Valley Senior Center. Take a right on 40th to head back to your car. You can continue the tour by car to visit Carnation Farms and the Vincent School House. To get to Carnation Farms take Highway 203 north of Carnation and take a left onto Carnation Farm Road. You’ll cross over the Snoqualmie River and arrive at the farm shortly there after. Carnation Farms was created in 1908, when founder E.A. Stuart purchased the original 360 acres of farmland—sight unseen because of a tip from his childhood friend, Sam Hill, that the railroad would soon connect to this part of the world. In purchasing this farm his first priority was to increase the productivity of dairy herds. Another task was to get the milk to one of his milk plants in Monroe though his friend Sam would solve this problem for him in 1911. Stuart’s ideas fundamentally changed milk production, the town of Carnation, and the world of dairy. After visiting Carnation Farms continue on the Carnation Farm Road to NE 80th then turn right. Go across the flats and take a left up to the Vincent School House. Residents built a schoolhouse in 1905 so their children could attend school close to their homes. The school housed all grade levels and included students from many pioneer families in the Snoqualmie Valley. About 20 students at a time attended the school. Teachers were typically hired for two- or three-month terms in the fall and spring, seasons when parents could release the children from their farming duties to attend school, and milder weather eased travel for the students from outlying farms. The school closed in 1942 and was purchased from the School District in 1943 for $1.00 by the Vincent Community Club. It was designated a King County Historic Landmark in 1986.